“Who puts milk in their baba ganoush? I need to talk to these people.” Cory Booker, the vegan junior senator from New Jersey, is full of jokes as he crosses his legs in his seat, a plate of Mediterranean Wraps take-out in hand. It’s a Saturday afternoon and I’m lounging in my sweats, eating falafel with a 2020 presidential candidate and having casual conversation about everything from the proper sweetness level of chocolate cupcakes to the stickers on my computer. Booker and my dad have been close friends ever since attending Stanford together, and on a recent visit to the Bay Area, the long-time family friend came over for lunch at my house and graciously allowed me to ask him some questions for Verde. 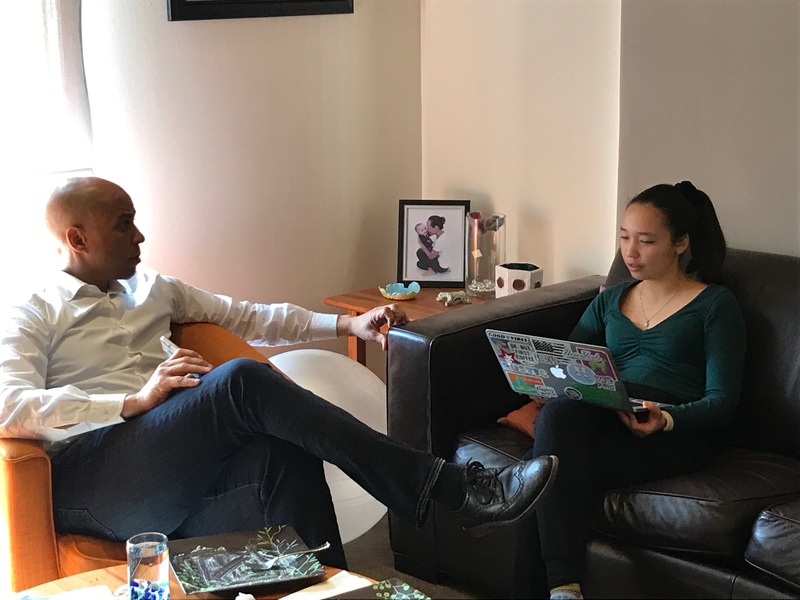 I came to this interview prepared to focus on Booker’s beliefs, gain a better sense of his connections to Silicon Valley and understand the reasoning behind his political initiatives. And while my short time with him accomplished these goals, I was also able to discover more about Booker’s personality. Although he’s a distinguished public figure who influences progressive policy in Washington and the lives of his community back home in Newark, New Jersey, his peaceful presence and humorous personality remind me that he’s also just Cory. V: Silicon Valley is famous for its technology and innovation. What role should those things play in national politics? Is Silicon Valley doing its part? C: Technology can be a powerful force, helping to democratize access to information, to opportunity, to capital. … It can really be a powerful force in the lives of everybody, especially when it comes to issues of inequality and justice. It can really help on those issues, but there’s a dark side too. Technology can aggravate disadvantages in our country, it could invade our privacy and undermine our security, and I think that we need to be aware of the light as well as the darkness of it all. Silicon Valley, as well as Washington, should be taking steps to make sure we’re seeing growth of the light and diminishment, if not elimination, of the dark. V: You are well known for your mantra of the “conspiracy of love.” How did you come up with this and why do you stand by this value? C: I think we as a nation are founded on ideals of love — patriotism is love of country, you can’t love your country unless you love your fellow countrymen and women. So much of this idea that actions remain in the moment is not true. … People who stood up for us and for the call of patriotism sacrificed and made contributions to this country — that resonates out to where we are today. So you may not know it, but those small actions of patriotic love, when joined together, they sort of overwhelm the world and can change the world as a whole. V: How has this view shaped your attitude toward a polarized America? C: I think that a lot of the reason [why] I’m running for president has to do with the fact that we need a revival of grace in our country. We need to reignite ideals of empathy for each other even if we vote different[ly] or have different political parties — we are still one America with one destiny. I think we need to start getting back to that idea that we need each other to be successful. That doesn’t mean we always have to agree or have a “kumbaya” type moment, but this idea that we all have dignity, we all have worth, we all have value. … at the end of the day, we’re all in this together and I think we need to affirm that in our politics and behavior towards each other. V: High schools all over the country are struggling with gun safety. Paly last year was put in a real lockdown due to a phone threat of someone coming to campus with a weapon. What do you believe can be done to help prevent school-specific gun violence? C: These things are all interconnected. The safety of kids in schools [is] related to the safety of people in movie theaters and churches and synagogues — we have a gun problem in America. They are too easy to get access to by people that have harmful intentions. I think, in general, we need to have common sense universal background checks and other safeties that close the loopholes that allow people who shouldn’t own guns to purchase them. V: How can students and teachers best educate themselves and become better advocates for school safety? C: I think there are a lot of times for early detection. People are struggling often in schools with mental health and other challenges and we need to have that kind of environment that supports folks. Folks might need some help or might be struggling or might be falling into the shadows of a community. … There should be more of a … therapeutic community, almost, to recognize when those problems are occurring [and] early interventions that could prevent those types of problems from manifesting within a school community. But overall, I think we as a nation need to own up to the fact that the ease at which we are getting guns allows people with ill-intent to do horrible things. V: Do you have any favorite memories from your time at Stanford? C: I mean, a lot. They were … five of the best years of my life. From playing football to just some of the friendships I had. … Those kinds of friendships, those bonds, they so enrich your life — they’re lifelong friendships, which is really incredible. V: Where did you like to spend time with your friends? Go out to eat? C: The coffee house on campus I loved. I still remember walking in there and there’s this two-woman band that’s playing there. It was kind of crowded, so I was like “Who’s this?” “Oh it’s the Indigo Girls,” and I’m like “Oh, the Indigo Girls, they’re really good,” and within six months they’ve blown up. But back then it was just a little thing in the Stanford coffee house. I loved Max’s Opera Cafe. … The [Palo Alto] Creamery was good. Is Fresh Choice still there? I used to love the cornbread and mush it into the soup. I like that place Togo’s. … And I used to get a chicken fajita pita all the time at Jack in the Box, but I’m a vegan now so I don’t do Jack in the Box. V: Verde is a high school publication, read by students and families, many of whom will be able to vote in the next presidential election. How do you think high school students can make a difference? Do you have any advice for us? C: I think that from uprisings in Soweto to the Civil Rights Movement to even the Tiananmen Square protest, you see young people are at the center of all great social movements for change. The Parkland students have been showing this recently, and probably some of the students from your high school. So the reality is not to say “How can I one day?” — it’s “Right now, what can I do today that makes a difference?” You shouldn’t let your inability to do everything undermine your ability to do something. I think that you should recognize that you’re powerful and that you can make a difference, that your voice matters, you should try to get out there and get engaged as much as possible.